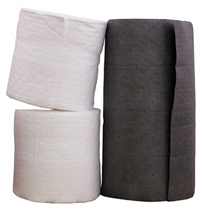 Stay-In-Place Floor Safety Rolls are ideal for high traffic areas. Stay-In-Place SIP Floor Safety Rolls, also called "Sticky Mat," is a revolutionary new product that combines a sticky back that adheres to floors and peels up effortlessly with top absorbent layer that absorbs all liquids. 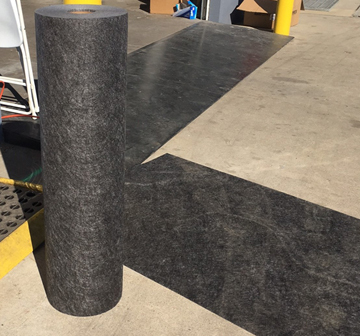 The roll stays in place and is the perfect applicaiton for high foot traffic in areas where a clean, non-slip surface is essential. Economical, universal, and easy to install and remove. Use full length or cut to the desired size. Ideal for high traffic areas, hallways, aisles, and entrances, or where ever you need a durable, absorbent mat to "Stay-In-Place." Adhesive backing sticks to the floor preventing falls by absorbing "all liquids." Sticky backing adheres to floors and peels up easilty. Shipping quotes are estimates only and do not include fuel surcharges that change daily. Actual rate may vary.